Tom and I had planned to go to St. Boswell’s today for the auction market but the weather was so atrocious that we decided not to bother. 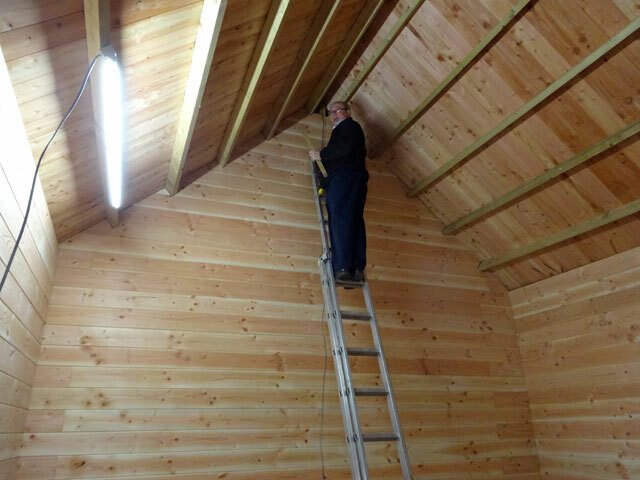 Instead we continued with our joinery project in the Bothy and made excellent progress. Everything in the basic shaping of the Bothy has now been done except for the second of the end walls which will require quite a bit of joinery as the pine is fitted around the joists. Almost everything else has now been boxed in and it is looking great – like a pine palace! Rachel shut herself in the kitchen to do her accounts, while Mum decided that she would have a lazy day. David did some work at his home on the brakes for the boat trailer and then joined Tom and me for the afternoon session in the bothy (and supervised the coffee breaks). I enjoyed an excellent shower at the end of the afternoon, a super meal in the farmhouse with everyone, and then relaxed in front of the stove in the Granary. Mum joined us and we watched The Great Fire, a four-part drama set in the time of the great fire of London. It didn’t come across to me as being a drama with a great deal of historical realism but it was great fun – especially when one can watch it all at one sitting, flitting through the adverts with the remote control and seeing the four-hour broadcast in just three hours. It has been a busy week, but a fabulous one.